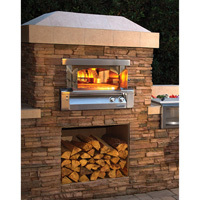 The Alfresco AXE-PZA-CART is a 30-in. basic cart to accommodate the Pizza Oven Plus. It brings the pizza over to counter level when there is no counter space available. 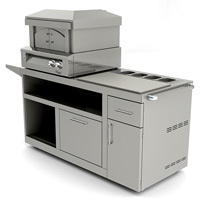 For convenience, it features a bottom shelf to rest a gas tank (not included) and its four wheels and handle allow you to move the cart around to best suit your needs. 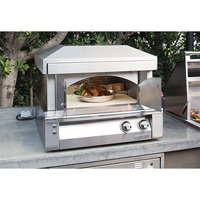 The Alfresco AXE-PZA-PPC is a deluxe-style pizza prep cart to accommodate the Pizza Oven Plus. It brings the pizza over to counter level when there is no counter space available. For convenience, it features four wheels and handle allow you to move the cart around to best suit your needs. 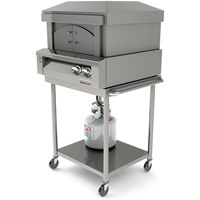 What makes this a "deluxe" cart is the various storage compartments, gas tank storage (tank not included), cutting/prep space and storage for pizza toppings.